I am in love with this fun idea for decorating your earphones. 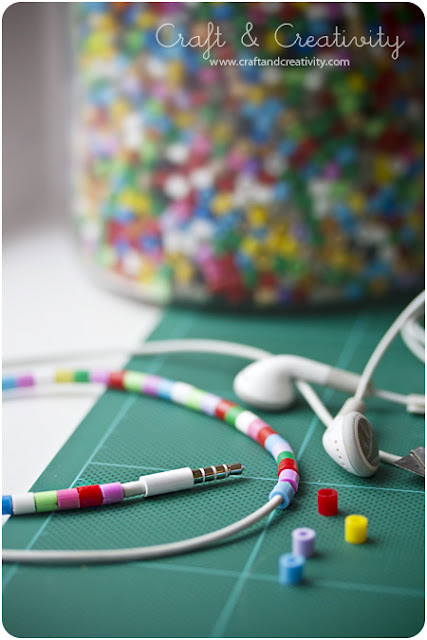 Craft and Creativity has a tutorial for using small plastic kids craft beads to add color to your earbuds. You could do a fun arrangement of red, green and white for the holidays, or just use your favorite colors to brighten them up. Besides being cute, it will help keep them from getting tangled and your husband won't be able to steal yours and say he didn't know they weren't his. You can check out this very easy tutorial for decorating your earbuds over at Craft and Crativity. Like is not a strong enough word! I am a little obsessed with them at the moment! L-O-V-E!! how do you put them on? ?